Take your team into Europe! 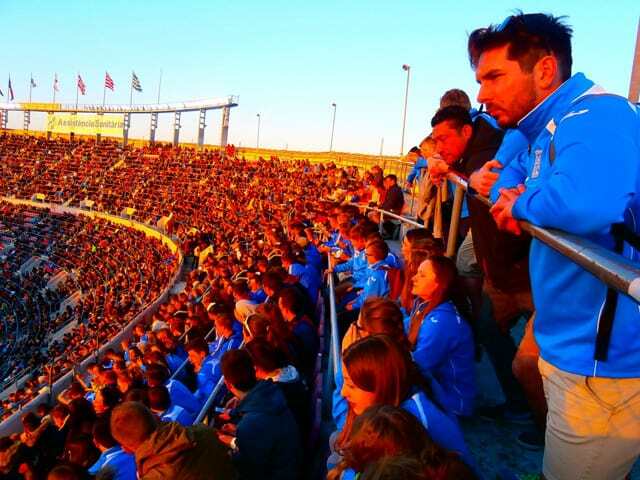 Barcelona is the most popular destination Football Tours to Spain programme. And that is no surprise because if you love football who wouldn’t want to go and play in Spain? It really is the chance of a lifetime which is why we work so hard to provide the best possible experience. There are a number of fantastic coaching options available. We have a staff of excellent professional coaches who have qualified via the FA Coaching pathways, in addition we have an option to work with former ESPANYOL captain Diego Orejuela, who now is the football director at the Palafrugell Centre. This is a must for teams looking for high end intensive coaching from one of La Liga’s most influential Spanish players! The magnificent Nou Camp Stadium is a ‘must-do’ for football tours to Spain. This iconic venue echoes with great names from the past right up to the present day. The chance to go behind the scenes and experience what it is like to be one of Barcelona’s stars will never be forgotten. Platja D’Aro is a fabulous little town situated on the Mediterranean coast just north of Barcelona. It is very safe and attractive and provides an ideal location to combine sport, culture and leisure in a natural setting. At its heart is a lovely seafront with impressive beaches and idyllic bays. The ease of access to the excellent local facilities and the opportunity for excursions to water parks, theme parks, Barcelona and the Nou Camp make Platja D’Aro perfect for school trips. 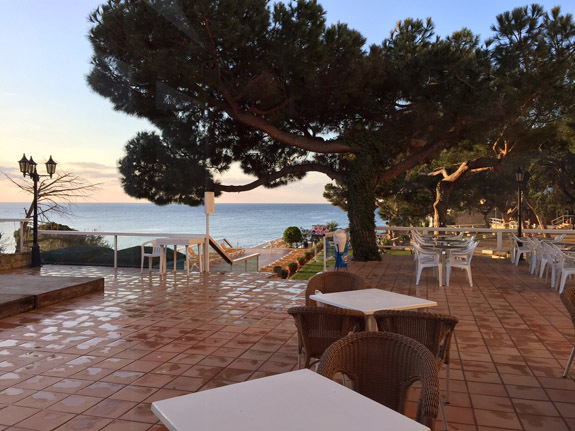 The Caleta Palace is in a perfect location, right on the beach in Platja D’Aro. It has consistently been the most popular hotel for Activ4 school trips. As a company we chose the Caleta Palace Hotel because of its outstanding location. It is only 300 metres into the resort of Platja D’Aro. Groups can walk to evening entertainment such as; Magic Park, Karaoke and Miniature Golf. Plus, who wouldn’t want a beach front location and we do mean beachfront. Caleta Palace Hotel guests can enjoy a dip inside the refreshing outdoor pool or walk directly onto the beach and swim in the Mediterranean Sea. A Football Sportsfest: Come and join in the fun at SportsFest, our sports festival in Spain! In this video we show you the resort and some of the sporting activities our teams got up to during their Sportsfest in Spain. Depart from school and head to Dover where you will cross the channel to Calais travelling overnight to the resort of Platja D’Aro. Make sure you take your favourite DVD’s with you to enjoy throughout the journey! On arrival at the Caleta Palace hotel your group will be met by a member of the activ4 resort team who will assist you with check in to ensure it runs smoothly. 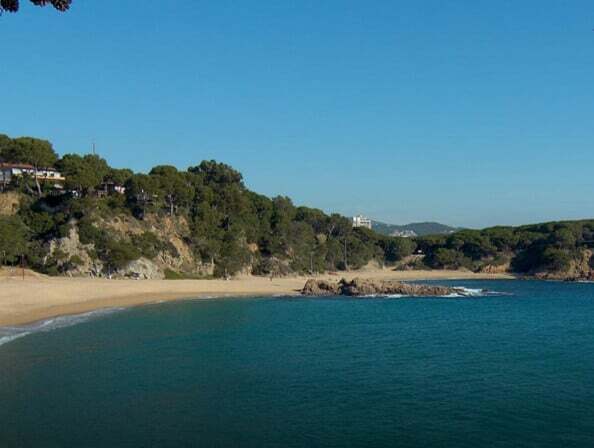 Located right on the beach and with direct access to one of the most beautiful coves on the Costa Brava, the complex features great facilities which will help you enjoy your stay; including a swimming pool, sun terrace, internet area, games room, and a restaurant with buffet service and Mediterranean cuisine on the menu. The tree lined promenade has lots of sophisticated shops restaurants and bars which makes it one of the most popular resorts on the Costa Brava. School groups have been coming to the resort for twenty years which is testament to how much it has to offer. There is a room onsite as well as an outside terrace area to hold a variety of evening entertainments for which there are numerous options available, possibly starting with a quiz night. Each day will start with a buffet breakfast before heading out for the day’s activities. Training will be done in the morning and one of the great things about touring in Spain is that they excel in so many different sports so their sporting facilities are superb ranging from fantastic indoor netball courts with tiered seating to 3G pitches just a short distance away. One of our main venues is in Fogars and has tiered seating for the rest of your group to cheer and chant! Fixtures are usually played during the evening with local club teams and your group will be escorted to your local fixtures by a local activ4 representative to ensure things run smoothly. Fixtures are often the highlight of the tour and clubs are always delighted to play British sides and offer a friendly welcome and a competitive game. Netball fixtures and tournaments are played against UK teams out in resort at the same time. As with all areas of activ4 programmes, evening entertainments will be carefully planned for your group and after the first of your fixtures many groups choose to round off the evening at ‘D’Aro Bowling’. The bustling cosmopolitan city of Barcelona is the Catalonian capital and has something for everyone. Your group can opt to take a tour around Europe’s largest football stadium, the world famous Camp Nou. Meaning ‘new ground’, Camp Nou was completed in 1957 and is home to one of the most successful clubs in the world, FC Barcelona. Your tour of Camp Nou starts with the visiting teams changing room and a walk through the famous tunnel onto the pitch to enjoy a panoramic view of the stadium. You will also visit the TV Room, Press Room, and the Presidential Box. With so many exciting photo opportunities make sure your cameras are at the ready! You will also get to visit the impressive Barcelona FC Football Museum where you can take a look back over the long history of the club, look at the photographs on display, admire the trophies, sports equipment and team kits from over the years. You will finish your time in Barcelona by heading to Las Ramblas for some shopping time. The students will love the shops, stalls and street entertainers and don’t forget to visit La Boqueria Market where the colours and activity are stunning. Back in Platja D’Aro this evening you can finish your day with a visit to Magic Park Amusements. As well as the latest simulator arcade games, you will find bucking bronco’s and indoor dodgem cars. On the way back to the hotel why not call in at one of the many cafes to enjoy Churros con Chocolate! Back to sport this morning with a training session where you can focus on developing and improving the techniques from your fixture earlier on in the tour. During the afternoon you may take a recovery session back at the hotel swimming pool or if the beach is for you then head straight over! The students will have acclimatised to their surroundings and will be keen to put in a good performance later on in the day. Prior to departure your tour manager will discuss the format and the standard of opposition required in order to get the most out of your tour. On the final night it has become a tradition for touring teams to hold an awards ceremony to decide on the player of the tour, most goals etc. Unfortunately all good things come to an end. After breakfast it’s time to check out but there is just enough time for some last minute shopping, try Les Gallerias just off the high street, and lunch before you head out to start your journey to Calais. On arrival in Calais you will set sail to Dover and travel back to school. The tour officially ends when you get back to the UK, but with a trip this great we are sure that it will live long in the memory.